The 90's were as good as it has ever got for Tranmere Rovers - but it was a case of close but not quite there. Promoted to Division 1 through a Wembley play-off victory in 1990/91 they then failed three times to get to the Premier League through the Division 1 play-offs. 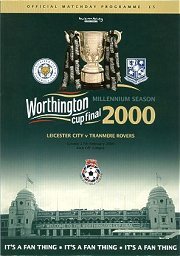 League Cup semi-finalists in 1993/94 they reached the final in 1999/2000 but lost to Leicester. They were relegated in 2000/01. Tranmere also completed an FA Cup tie against Sunderland with 11 players on the pitch - despite having had one sent off!